Muslim countries celebrate their two feasts in different forms. The feast which follows the holy month of Ramadan – Eid Al Fitir and the feast of the sacrifice – Eid Al Adha, are referred to in Emirati dialect as the Small Eid and the Big Eid. 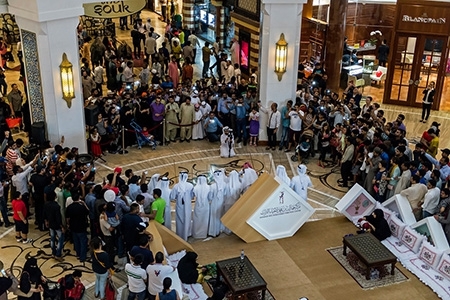 For the annual Eid occasions, the Center organizes a series of activities in different locations across the UAE to promote the country’s traditions. The Center distributes Eidia (a sum of money given during Eid) and sweets to children during the various events and activities held during Eid.